The tree had been on fire for over a week before anyone noticed. The Senator, one of the oldest Cypress trees in the world, was killed when a smoldering ignition from an errant lightning strike slowly transformed it into a towering chimney and fuel source in one. Or maybe it didn't happen like that at all. Perhaps it was an errant cigarette, or a sinister match strategically placed in its hollow berth. The mystery endures, but the fact remains: on January 16, 2012 The Senator collapsed and died, engulfed in flames. It was 3,500 years old. Back in 2007, I went to Orlando to photograph The Senator as part of The Oldest Living Things in the World, my art and science project consisting of continuously living organisms 2,000 years old and older. I had recently returned home from Africa, where I'd driven around the Limpopo in search of ancient Baobab trees, visited an underground forest in Pretoria amidst a morning threat of ‘smash and grabs,' and taken a road trip from Cape Town up through Namibia to find the genuinely odd Welwitschia Mirabilis, which looked more like a science fictional sea creature than a primitive conifer punctuating the vast and empty Namib Naukluft. And then I flew to Orlando. 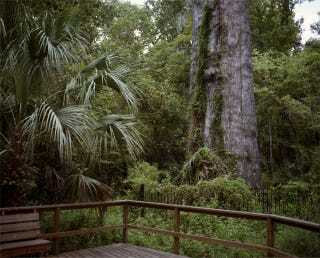 The Senator was the primary attraction at the aptly named Big Tree Park, just twenty minutes worth of strip malls from downtown Orlando. In fact, it was the original Orlando attraction, BD (‘Before Disney', if you will), visited via horse and carriage. I drove with a friend in her family car. We parked in an orderly lot, walked a quarter-mile on a planked path through the once-swampy woodland, and arrived at the tree just like that. Named for Senator M.O. Overstreet in 1927, it was impressively tall and robust while not overly gnarly, and kept company with Lady Liberty, which at 2,000 years and a noticeably svelter silhouette – save for a knotty eye-level north side bustle – made for a May-December pairing. Families with cameras looked up and strolled between the two, the children quickly bored and retreating to the playground. I snapped a digital shot for a couple who asked, out of proximity rather than expertise, that I take their picture in front of the tree. I then took out my medium format film camera and made some photographs of my own. I make large-scale fine art prints of my work, and feel that I get the best of both worlds by shooting film, and making high resolution scans of the negatives and making archival pigment prints. When I got the film back I knew I had missed my mark: there were some interesting compositions, but I hadn't captured the spirit of this remarkable being. I was coming to see my subjects as individuals, and as such I wanted to make portraits of them rather than landscapes; to encourage anthropomorphism, and create a means to connect to Deep Time – thousands of years of a life distilled into 1/60th of a second. And with that, I made an unceremonious decision to return to The Senator when opportunity allowed. In the intervening years I traveled to Greenland for lichens that grown only 1cm every hundred years, to Chile for the strange and wonderful Llareta plant growing at 15,000 feet and a desert-cousin of parsley, and to Western Australia for the stromatolites, tied to the oxygenation of the planet and the very beginnings of all life on Earth. I went to Tasmania in search of a 43,000-year-old shrub that is the last of its species left on earth, rending it both critically endangered and theoretically immortal. But in five years, even despite having visited Florida a couple of times to see family, I did not make it back to The Senator. It was too easy. It would always be there. Surely, if The Senator had been around for 3,500 years, it was going to be around for 3,505. Extreme longevity can lull us into a false sense of permanence. We fall into a quotidian reality devoid of long-term thinking, certain that things which have been here "forever" will remain, unchanging. But being old is not the same as being immortal. Even second chances have expiration dates. The comparative ease of access and the seeming lack of urgency bred a certainly complacency in my return to The Senator. I met Jim Duby, Program Manager of the Seminole County Natural Lands Program, at the locked gate of the park. Jim has been to the site every day since the fire. The investigation is considered ongoing, but after speaking with him, it was hard for me to consider the cause of death to be anything but human intention. There was no lightning recorded in the area during the weeks in question, and the tree had been newly fitted with a lightning rod. The idea that it had spontaneously combusted under its own auspices simply seemed absurd. On the other hand, the tree was visibly hollow before the fire, and an opening at the base of the trunk, once filled with concrete, was now large enough for a person to squeeze through and stand inside. Or to drop a match into, and run. The Senator was likely spared the long-ago ax of the logging industry because it was hollow, but the very same defect ultimately sparked its death. After spending over six years of my life researching, photographing, and traveling all over the world in search of ancient life, it has put my own mortality into perspective. I have a more immediate understanding of the briefness of a single human life in the face of the incomprehensible vastness of ‘forever,' and at the same time, when standing in front of these organisms, I feel a connection to the moments, small as molecules, that shape a constantly unfolding narrative on both a micro and macro scale. Any given moment matters. The charred remains of The Senator Tree, February 8, 2012. For the Senator, there is a glimmering chance at a second life: clippings from the tree were taken years ago and successfully propagated in a nursery. The resulting trees are now 40 feet tall, and could ostensibly be transplanted into the very spot after a long and careful root-stabilization process. There are also seedlings at its base that, with a little paternity testing, could prove to be its clones rather than its progeny, or perhaps some new growth will be forced from the existing root system stimulated by the stress of the fire. Rachel Sussman is a Brooklyn-based artist and photographer. Over the past six years, she has traveled the world to document Earth's most ancient organisms in her project The Oldest Living Things in the World. Rachel has exhibited across the U.S. and Europe, received numerous awards, and spoken at TED. You can follow her global adventures on Twitter. Brain Pickings has a free weekly newsletter and people say it's cool. It comes out on Sundays and offers the week's best articles. Here's an example. Like? Sign up.